Nah. 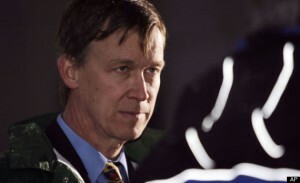 Don’t worry, our former fearless leader, John Hickenlooper, all of a sudden isn’t a decisive and bold leader in his opinion piece in the Washington Post in which he denounces Alexandria Ocasio Cortez’s Green New Deal. He’s giving Democrats cover for voting no in the U.S. Senate. Which, by the way, all of them did. See, it’s not that Hick thinks the concept of a Green New Deal is a bad idea (although it is). It’s just that this Green New Deal sets Democrats up for failure in truly addressing climate change. Or something. According to Hickenlooper, there could be a better Green New Deal out there somewhere. We are on deadline, y’all, to save the planet and AOC’s Green New Deal doesn’t address it fast enough. We guess. Of course, the fact that this op-ed came out in the same week that news broke that Greenland’s largest glacier isn’t melting as oft-cited by the enviros, but is expanding quickly, is pretty sweet. Either way, it’s a pretty easy route to criticize something that’s already going down. Where was this bold leadership a month ago when AOC wanted to put both the oil and gas and ag industries out of business?